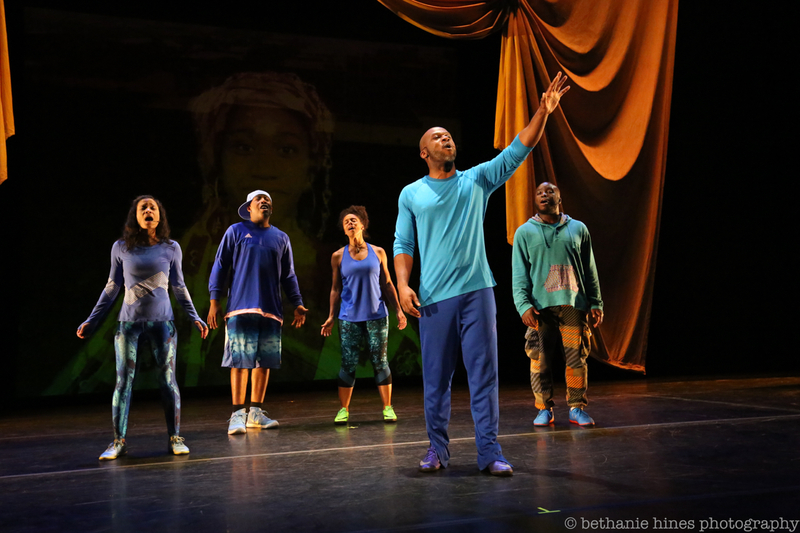 Soccer—as both an intricate, euphoric choreography and an exploited corporate cash cow—is the subject of /peh-LO-tah/, an electric meditation on the racial dimensions of the sport from multi-talented theater artist and performer Marc Bamuthi Joseph (red, black & GREEN: a blues, 2012 Next Wave). Using spoken-word poetry and fútbol-inspired footwork, Joseph and four performers dribble and pass their way from the pickup games of rural Haiti to the mega stadiums of Rio and Johannesburg, parsing the social justice of soccer to the sounds of hip-hop and samba. Against his own childhood memories of the game as a race-transcending source of happiness, Joseph posits a global reality in which black joy is all too often co-opted for financial gain, yet perseveres nonetheless. We sat down with Joseph to discuss the work in anticipation of its New York premiere this fall during the 2017 Next Wave Festival. Can you discuss the idea of soccer as a universal language? Soccer isn’t just the world’s most popular sport, it is the activity to which we globally assign the most value as an emblem of cultural aesthetics. It isn’t just success on the pitch that communicates a nation’s character, it’s how the game is played, from Ghanaian grace to Brazilian flair to Spanish polyrhythm to German focus and consistency. That universality then is more pronounced against the stark contrast of political monocultures and repressive regimes. How do we register that universal joy in the shadow of South African apartheid? How do we reconcile with a country that meddles in the elections of other sovereign nations and also invites the planet to roam freely within its borders during the World Cup? In this case the sport reveals that joy is universal, as are the contradictions inherent among the men and women who passionately engage in it. Did you and your collaborators develop the soccer-inflected movement just for this work, or is it something you've used in other pieces? 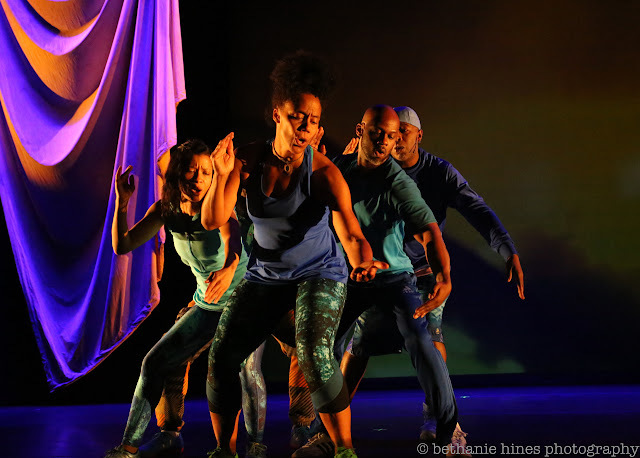 All the choreography for /peh-LO-tah/ was created by Stacey Printz in a series of residencies that we executed around the country from Dallas to San Francisco to Atlanta to Middletown, CT at Wesleyan University. Stacey is a relentless and prolific movement generator, and she transferred that ethic to the creative process in complement with the original music, text, and direction of the entire team. The choreography was made for these bodies, taking into account the folkloric vocabulary and mastery of Amara Tabor Smith and the contemporary and lyrical elasticity of Traci Tolmaire. These women, as much as the athletic and geographic influences that undergird the entire piece, formed the inspirational backbone for our choreographic design. Can you share some thoughts about black athletes taking a political stance? Besides Hip Hop itself, Black Lives Matter is the longest sustained grassroots movement of NOTE in my lifetime. Ironically, what sustains the movement most is not necessarily the activists themselves as much as the fact that cops or vigilantes keep killing unarmed black people. Even if folks wanted to mute the campaign, they couldn’t because Walter Scott is getting shot in the back, or Sam Ambrose is getting shot in his face, or 9 people are being annihilated in the house they came to pray in. The movement is a place of mourning, and has also been a site of paramilitary opposition, so you can understand the edge, in the time of this drought, you can sense the extra parched thirst for wet justice to come rolling down. What is the visual score for this stress? Consider the theater of grainy camera phones pointed at Oscar Grant, grainy audio picking up the distant sound of Trayvon Martin’s final moments, and the alternative iconography comes from where? Rap? Ask yourself what is your normalized view of black people as a mass. Not a few people in your workplace, I’d submit that in the American imagination Black people don’t tend to aggregate in places of success. See us imagined by America in mass and the landscape might be poverty, jail, and at best church. So the most worthy action ANY Black person with a high visibility platform might do right now is place black joy among the white noise and make something beautiful and participatory so that we might consider Black life in public space in a frame other than rage or grief. Whether it’s Lebron James or Serena Williams or Colin Kaepernick, there is an ethic among Black athletes that understand this reality, and are taking their lead from Muhammad Ali, or Wilma Rudolph, or Kareem Abdul-Jabbar to activate their high-visibility perch in the name of political progress. These athletes understand the stakes and know there ain’t no more time to play games. Please talk about the educational component of /peh-LO-tah/. As part of my development process, and through a commission from the Guggenheim Museum, I developed a kinetic learning module that accesses /peh-LO-tah/’s field of inquiry and creates a sports-based political action for kids of color, particularly young immigrants, and their parents. This project is called “moving and passing” and it intersects curriculum development, site specific performance, and the politics of joy while using soccer as metaphor for the urgent question of enfranchisement among youth of color. A hallmark of the on-field learning project is a series of culture breaks featuring live performance, on-site dance and art making, a series of soccer drills designed to improve players’ on-the-ball skills, and the use of poetic text to contextualize those drills and movement as social concepts. We combine play with poetry and visual iconography and connect moving on the field without the ball to moving through this country without ‘possession’ of ‘center’. “Moving and Passing Curricular Tactics” (M-PACT) is a 5 week curriculum that I designed that takes this process one step further. Using text and media from /peh-LO-tah/ and other sources, M-PACT engages participants in a month long writer’s workshop whose outcomes are poems, personal narratives, and media pieces. Students are challenged to correlate characteristics of the world’s game to characteristics of some of the world’s pathologies. Participants are further given agency to develop the poetic underpinnings of immigration-centered personal essays. Our goal is to have students emerge from 5 weeks of M-PACT with a small portfolio of written or digital pieces that captures their personal narrative at the crossroads of sport, race, economics, constitutional law, and dreams in defiance of the impossible. /peh-LO-tah/ comes to the BAM Harvey Theater Oct 18—21 as part of the 2017 Next Wave Festival.